The success level of an event at the Hacienda de las Flores is often measured by the level of confusion created by cars jamming the parking lot of the historic property. In that regard, the first food truck event of the year was already a big success: it was really difficult to access even the drop-off at the public park. But once drivers found a parking space, most likely along an adjacent street's curb, the fun was complete; some 500 residents of all ages playing and frolicking joyfully filled the lawn and visited the attending food trucks, enjoying a perfectly serene dinner under the majestic trees. The July 20 evening garden party was a striking sight. Six food trucks had parked on the driveway around the large green expanse of the lawn. On it the parks and recreation department had installed 25 large wood picnic tables where families sat to dine. In the middle grassy area, people played old-fashioned lawn games and groups sat on blankets with picnic baskets. Long lines of adults formed in front of the trucks while dozens of little children age 4 to 7 played chasing games around the tables and groups, and younger ones just toddling were learning to walk on the grass under the watchful eye of an adult. Groups of older residents attracted by the mild weather and the perspective of not having to cook were spending the evening putting the world to rights and playing guessing games about who would run this year for town council. From time to time a little group of teenagers from the local high school strolled by, putting on airs of such dignity and showing off their summer tans. Old friends were meeting in the lines, some council members were meandering and talking to their constituency while parks and recreation staff member Clinton Calkins was keeping an eye on everything. The organizer of the evening had been there since setup in the morning and was enjoying a slice of pizza, knowing that he would have to stay late that night to make sure everything was cleaned up and ready for the wedding booked for the next day. Calkins had hired the six trucks. He explained that it was a mix of old favorites and new ones. A foody himself, Calkins had tasted everything and was confident residents would enjoy it. At a nearby table three young mothers with their little ones, including a newborn, agreed that there was food for everyone at the event and that all was delicious. They said that they had bought food at the trucks last year and were very happy to see them back. For them, besides the food, the community feel and the beauty of the space were the prime attractions. 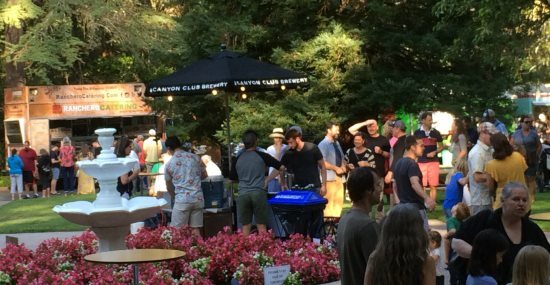 This Friday night an additional vendor captured a lot of attention: Canyon Club Brewery that is set to open at the corner of Country Club Drive and Canyon Road before the end of the year installed a stand and was providing samples of a few of its alcoholic creations. Calkins explains that this is his third year organizing the event, making it a much easier task. He knows the trucks and their owners and how to negotiate with them. 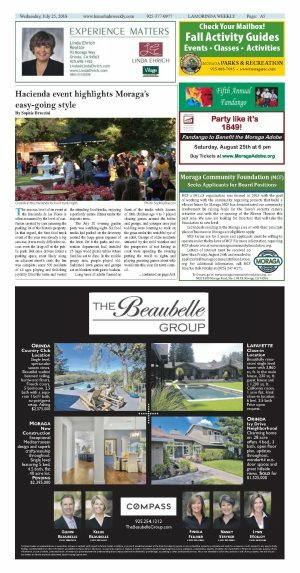 The town had to do it that way rather than hiring a company such as Taste of the World to run the event because all the existing truck companies deemed Moraga too small to be worthy of their attention. 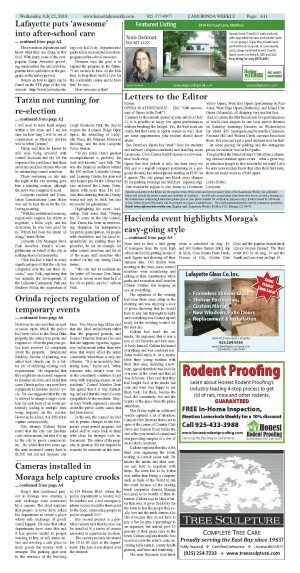 Calkins says he likes it better that way; it gives flexibility for the town to hire the people they really love and the truck owners also like it because they do not have to pay a flat fee plus a percentage to an organizer, but instead give 10 percent of their gross sales to the town. Calkins explains that the fees received cover the town's costs, including table rentals, county health permits, staff time and marketing. The next Hacienda food truck event is scheduled on Aug. 10, and will feature Yummi BBQ, Sip & Slide, Cosa Nostra Pasta Truck, Flavors of Cali, Golden Gate Gyro and the popular dessert truck Izzya's Frozen Custard. The third event will be on Aug. 24 and the fourth and last event on Sept. 14.